The PRO-CAST® Series machines integrate a sturdy steel structure with a solid, level platform that uniformly supports the moving web casting/coating surface. One casting/coating method is with an adjustable doctor blade assembly with a micrometer adjustable gap positioned on a precise casting/coating surface which has been ground and certified to a tolerance of at least ± 0.00026″. 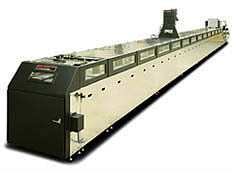 Precise, smooth control of the carrier or web is also essential to assure uniform films. This is accomplished with the use of a microprocessor controlled digital drive and closed loop feed back system. To assure properly cured cast/coated films, a drying chamber is provided where forced, filtered and preheated air is continuously drawn over the moving web in a counter-flow direction for convective drying, solvent gradient control and exhaust removal. Optional under bed heaters deployed below the carrier in temperature controlled zones extending the length of the machine, provide even more effective drying of the web being cast/coated. 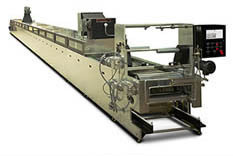 The final dry, cured product may be continuously trimmed, slit or stripped from the carrier or web and collected on motor-driven, synchronized spools provided at the exit end. PRO-CAST® Series of Tape Casters/Coaters are routinely used worldwide to produce thin and thick films and layered products. Designed to provide the best possible control and casting/coating for premium quality films, this series was developed through an analysis of customer requirements in the advanced ceramics, fuel cell and lithium battery industries, and a study of the best industrial systems previously available. HED International’s clear objectives of improved and repeatable performance, reduced maintenance, and simplicity have been achieved by a variety of means. All PRO-CAST® Series Tape Casters/Coaters control production variables such as casting/coating speed, temperature profile, solvent gradient, air flow, casting/coating thickness and surface.